Modern tournament Blood Bowl has become something of a trail of tiers, so popular have bonus skill packages for the weaker teams become. But what exactly what are we trying to achieve? As far as I have seen it described the problem tiers are trying to solve is one of repetition. Coaches do not like to have to face the same team over and over again, be it during a single event or over the course of several. In the lead up to large events we see coaches poring over team lists to see how many different races will be attending an event, and the word diversity seems to have become shorthand for this. This effect is naturally going to be felt more keenly if results against the offending team are poor, and so we have a situation where the best teams (Undead, Wood Elves, Lizardmen) become seen as problematic in and of themselves. There is a doubling of the impact here, as the best teams will both be more prevalent and be those that inflict the most defeats. But in the hypothetical extreme case that tiers made Ogres the best team and people were facing them game after game, the complaints would still be swift in coming. So it seems that the desired end goal is that any given tournament should have as wide and as flat a distribution of races as possible. I am going to assume that trying to achieve this is the problem we as a community would like to solve. That coaches don’t want to face the same 6-7 teams over and over again and – very importantly – it doesn’t matter what those teams are. When we get to the World Cup and every squad is made up of Wood Elves, Undead, Dark Elves, Necromantic, Humans and Chaos I suspect there will still be complaints. Three days of playing in that environment is going to seem just as stale as in the traditional ‘big four’ meta. When it came for me to design my own tournament rules my main concerns were not diversity or balance. Instead foremost in my mind was a desire to make every team fun or enjoyable to play. Games Workshop explicitly intended some teams to be worse than others in Blood Bowl. This isn’t Warhammer, 40K or AoS where armies are nominally supposed to be equal, and if you want to introduce an element of asymmetry there are scenarios where one side has fewer points or is defending an objective. Those systems can accommodate that quite easily, and in fact thrive on it. But Blood Bowl is played within the same parameters every time: A pitch 26 squares by 15 squares; no terrain; 11 players a side to start. Blood Bowl very purposefully has teams of differing power levels to offer challenges to those coaches who would like them. So a decade ago when I designed all my tiers for my ‘Ironmanj’ rules the team I used as a test case were Nurgle. I always felt like they got short shrift, not in the sense that they were bad – which they were – but in that they never got to be very, well … Nurgle-y. I didn’t worry about offering a Nurgle coach the opportunity to compete with Undead or Wood Elves on a strictly even power level. I instead thought about giving them the chance to do fun, Nurgle-ish stuff like having a bunch of Tentacles or Foul Appearance, but without having to pay a huge opportunity cost for the privilege. The desire for diversity is different from wanting perfect balance, and I believe this is where a number of tournament rulepacks might be going wrong, misidentifying the problem as ‘overpowered’ Tier 1 teams or rubbish Tier 2 teams and so lavishing extra skills and money on those who are deemed to be missing out. Whilst it is true that in a world where all 26 teams were perfectly balanced, diversity would be a natural consequence. But that is to confuse a sufficient condition with a necessary one. Blood Bowl was never intended to have perfectly balanced teams, and we can achieve a much greater degree of diversity without worrying about balance or power levels. Indeed, certain teams cannot really be balanced as they were designed around extremely swingy random mechanics. In order for say Vampires or Ogres to have a win rate equal to Wood Elves, they would need to be given so many skills that the main factor deciding any given game would be the Blood Lust / Hypnotic Gaze / Boneheads rolls. Both coaches would be virtual spectators. But we don’t have to make every team equal, we just have to make them equally attractive. The three most popular teams were the best team in Tier 1 (Wood Elves), one of the best teams in Tier 2 (Humans) and the best in Tier 3 (Chaos). 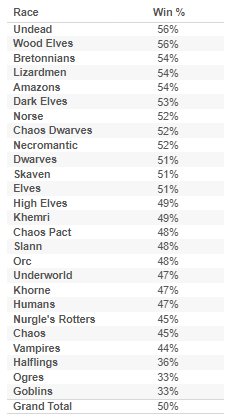 Chaos, Necromantic and Humans alone accounted for 24% of the field, more than Skaven, Amazons, Bretonnians, Chaos Dwarfs, Norse, Chaos Pact, High Elves, Khemri, Slann, Vampires and Khorne combined. This doesn’t seem particularly diverse to me, and it appears as if the likes of Skaven and Norse are paying for the ‘sins’ of the big four Tier 1 teams whilst the likes of Wood Elves and Undead chuckle to themselves and keep on doing exactly as they always have done. This is from games played under the old LRB5 rules, and whilst it is not applicable with regards to today’s game, it does give a flavour of the perceived power levels of teams if we wipe the tiers from our analysis. The problem with applying tiers to this is that the cut off points are seemingly arbitrary, with the gap in win rates between the top and bottom of the potential tiers far greater than those between the bottom of one tier and the top of the next. 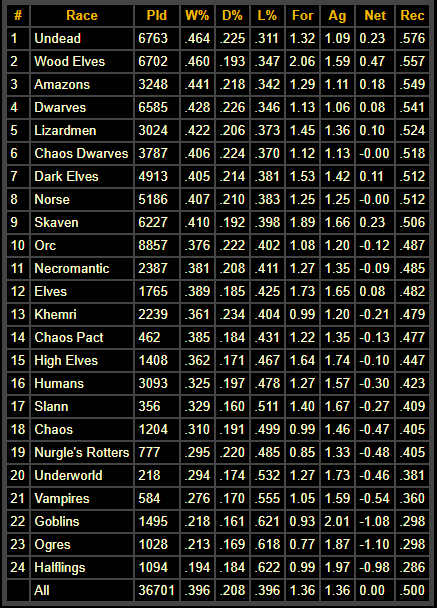 For example the gap in win rate between the best team in what became Tier 1 (Undead) and the worst (Skaven) is a whole 7%. Whilst the gap between Skaven and the team at the top of Tier 2 (Necromantic) is only 2.1%. This leaves Skaven in an unenviable position, squeezed from both sides as they have to play the teams above them at a disadvantage and the teams below them at a disadvantage too because of their extra skills. As an aside, these two tables demonstrate another point, which is that there is little use giving bonus skills without a full understanding of context. You can see that Lizardmen and Dark Elves performed considerably worse before the tiers than they do now. But isn’t that counterintuitive? Shouldn’t bonus skills for weaker teams mean that the best teams perform worse? We can otherwise see a flattening out of win rates amongst the non-Stunty teams. But of course there are numerous other factors at play in this data. A key one here perhaps is that tournaments have moved from a low-skill environment – perhaps just a single skill per game – to one where skills are gifted in greater numbers and often all at the start of an event. Whilst Undead and Wood Elves thrive in just about any format, Lizardmen and Dark Elves need a certain foundation of skills before they become competitive. So when designing tournament rule sets we need to keep a multitude of secondary factors in mind. A more specific example of this can be seen in the World Cup rules for Dornbirn. A seemingly minor rule that allows one player to take two rather than just one extra skill seems to have had a major impact on the metagame, with the teams best suited to making use of this to stack Clawpomb exploding in popularity. But to return to the wider point, we can see here how much of impact is being made as the tiers roll down. Necromantic have pushed their win rate up to the point where it is level with or higher than five of the teams in the tier above them. Given that this data also contains a lot of non-tiered games, we are now in a position where coaches know that taking Necromantics with bonus skills is strictly better than taking many lower Tier 1 teams. I’m not sure this was really the desired end point. Surely the aim was for a smoother and gentler transition between the tier boundaries? If we want to see as many different teams as possible playing in our events then it is probably wise not to make teams people were previously happy to take less attractive. Sure, give the lesser teams some help, but if the step point is so stark then we end up robbing Peter to pay Paul. The easiest way to achieve a diverse meta is to make 15 or more of the 21 non-Stunty teams appealing in roughly equal measure. If every single event just screams ‘take Necromantic’ then all we are doing is taking ten good Tier 1 teams and replacing them with the five ‘big four plus Necro’ teams. So, are there any solutions? I think so. Firstly, be the change you want to see. This topic is an interesting case study in ‘do what I say not what I do’. The community seems to vastly favour taking teams that give them a strong chance of winning games, despite this contradicting its stated desire of having an environment with a rich diversity of teams. Desiring diversity in the teams one faces whilst also selecting a team based on how powerful it is are competing objectives. If everyone does the second then nobody gets the first. Expecting everyone else to take lesser teams so that you can have a nicer time isn’t the most coherent of ideals. If you really want tournaments to have a wide range of teams, then take a wide range of teams. If you’d rather just take the best teams so that you can do well at tournaments, that is perfectly fine! Just admit it. Here there is no stacking allowed and all the skills come before the first game rather than being staggered throughout the tournament. Whilst this table might not be exactly what I would do (tiers One and Two could easily be squashed together without DEs or Lizards seeming less attractive), you can see the thought at work. Chaos still get a hefty boost over Undead, but it is only a 70% bonus not a 150% one, and they are not also getting that same bonus over Skaven or Orcs for example. I’m really looking forward to seeing how this impacts the distribution of races! TL;DR – Tier 1 needs to be split in half and bonus skills awarded more gradually. Thanks for reading! 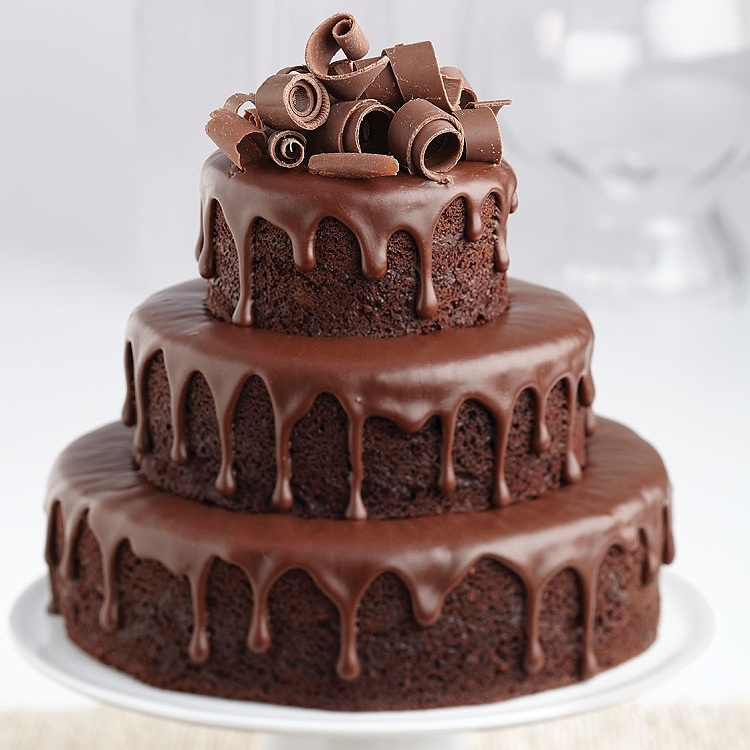 If you enjoyed this please comment or even just press the like button, or if you really dig my Blood Bowl articles then you might even consider contributing to my Patreon page. At the moment I am writing a series of Patreon-exclusive NAF World Cup 2019 guides, one for each of the 26 teams!